SUMMARY OF RESULTS: Barlow used the Freedom of Information Act (FOIA) to request documentation of number of seeds produced each year (2007-2017) at the two ex-situ plantings of Torreya taxifolia in northern Georgia (one administered by Atlanta Botanical Garden and the other by University of Georgia's State Botanical Garden). She also asked for "ultimate destinations" of the seeds each year. Documentation provided failed to supply any of the numbers/destinations per year for this critically endangered tree species, native to northern Florida. This led Barlow to conclude that ex situ seed production was uncounted and therefore presumably unvalued. (2) the ability of this "glacial relict" tree species to thrive when offered "assisted migration" several hundred miles northward into the southern-most Appalachian Mountains. • Freedom of Information Act Request, by Connie Barlow, 27 March 2018. FULL TEXT OF THE FILING: The Fish & Wildlife Service has not yet posted anything in its ongoing reports database as to the actual quantities of endangered Torreya taxifolia seeds produced year-by-year from ex situ plantings in Smithgall Woods and Blairsville GA, since those trees began producing seeds. It is important for the public to know the success of seed production, year by year, and especially the final destinations of those precious seeds, as produced under the terms of the 2010 update of the ESA recovery plan for this endangered species. My concern is that the seeds at Smithgall Woods may have been unharvested, and therefore "wasted" as food for local squirrels. "The material planted at Smithgall Woods was propagated from all Georgia source population material (Army Corps. of Engineers, site at Woodruff Dam, Lake Seminole, in Georgia). The trees have grown quite large and are now reproductively mature producing male and female cones annually." As founder of the citizen activist group Torreya Guardians, I would like to know documentation of seed production year by year, beginning in 2007. I am aware that the Blairsville site has likely been producing seeds every year since 2007, yet there is no online documentation of quantities and year-by-year reporting of ultimate destinations of the precious seeds. Please provide me (and thereby our group of citizens) this information. You can access our group's website at http://www.torreyaguardians.org/. Our group, Torreya Guardians, has been mentioned in many academic papers and some media reports as successfully pursuing the "assisted migration" northward of the USFWS endangered species, Florida Torreya. Yet, March 1-2 a USFWS staffer (Vivian Negron-Ortiz) in charge of this species attended a "Torreya Symposium" organized by a variety of institutions. Today, an article appeared by a journalist in an online environmental magazine that indicates that the "official" plans created by this institutional team exclude coordination with our group. Yet the 2010 recovery plan mentions in 3 places for institutions to coordinate their efforts with us. Our group is entirely engaged in moving seeds north, as an easy to implement and inexpensive solution to the species' ongoing decline (since its listing as an endangered species in 1984) in its small peak-glacial refuge in Florida. Yet the article indicates that the official institutions and scientists plan to engage in expensive and highly interventionist strategies of freezing embryos and also undertaking CRISPR genetic manipulation  with no indication that they are considering the success we are achieving in simple and cheap actions of simply helping this large-seeded species move its seeds to cooler realms. You can access this journal article (March 27 in Yale Environment 360) via the newest entry posted on our own Torreya Guardians reports page here. 1. Torreya Symposium announcement: genetic engineering of Torreya taxifolia as the next step (March 2018), see the paragraph immediately above. Finally, I knew that the speaker from the Atlanta Botanical Garden, Emily Coffey, had only recently joined the institution as Vice President for Conservation. On February 14 I contacted Carrie Radcliffe by email in order to convey my message to Emily Coffey "as you see fit." Below is the email exchange: Barlow to Radcliffe; Coffey to Barlow; Barlow to Coffey; Radcliffe to Barlow. Barlow interpreted the email from Coffey as hostile. "... someone removed all of the fruits from the Torreya safeguarding Collections at Smithgall Woods State Park... While we have no knowledge of who was responsible for the above action, we would like to point out that the Torreya Guardians and their volunteers are not members of the GPCA... The GPCA does not sanction assisted migration of Torreya outside its range, and we do not support the movement of Torreya outside the state of Georgia.... GPCA members and Botanical Guardian volunteers are advised to be cautious when speaking to any members of Torreya Guardians... GPCA is publicly distancing itself from Torreya Guardians and their methods of rewilding an endangered species outside its range." Note: Barlow to Coffey (Feb 20 above) clarifies that, because we had been receiving seeds by donation of the superintendent of the Blairsville site for several years (7,000 seeds in autumn 2015), we would have had no interest in any from Smithgall Woods  certainly not to steal them. Because I (Barlow) was hopeful that this clarification might re-open the door for communication and perhaps teamwork, I did not mention a deeper concern: that state and federal governmental agencies would have cut off communications and sullied the reputation of a group of citizen volunteers without, at minimum, letting us know that they were doing this and why. Hence, when the announcement was made at the conclusion of the Torreya Symposium (two weeks after my reply to Coffey) that genetic manipulation would be the next step for institutions operating under the official ESA plan (and with no opportunity for public comment), I decided to initiate an FOIA data request, which I had reason to believe would confirm that the management of annual seed production at Smithgall Woods had been, simply, to let the local squirrels harvest the seeds  and possibly to neglect even documenting the numbers of seeds produced in each of the previous 10 years. To my mind, if that proved true, it would represent both a serious conservation error and lapse of scientific rigor to chart recovery year by year in an ex situ planting. The section below lists and links to the FOIA data results and the communications along the way. • FOIA to Barlow March 29 - granted expedited processing and established Tiffany Mcclurkin as the contact. • FOIA to Barlow April 6 - "... Your request falls in the "complex" processing track. Requests in this track will take between twenty-one workdays and sixty workdays to process...."
• FOIA to Barlow July 6 - "... "I'm currently in possession of the responsive records for your request, but it requires a review and signature prior to sending to you. Some information will need to be sent to the Solicitor's Office for review prior to sending to you, but there are some documents that have been deemed clearly releasable. I hope to have a partial response to you soon. Thanks for your continued patience." • Barlow to FOIA July 6 - "Thank you! Now that I know the work has been done, feel free not to rush with the final sign-offs. Receiving the full results within two weeks will be fine with me." • Barlow to FOIA July 19 - "We had an email exchange on July 6 where we agreed to add 2 weeks onto the original 60-work-day due date for my receipt of the FOIA response. Tomorrow, July 19, will be two weeks. I have two journalists wanting me to make some comments, and I need to see the FOIA results before I do so. One is writing a book with just one chapter on Torreya Guardians, so he has no trouble with some delay. The other is a journalist writing about our group for Earth Island Journal, and her deadline for submitting her article to the editor is end of July. So, please send me whatever you can as soon as possible. And then let me know the character of what (if anything) is still awaiting a final signature and when it will be coming my way. I, of course, know that you personally have no control over that happening. But maybe you can nudge him or her that the information is crucial for my responding to a journalist right away. Thank you for helping me respond to an urgent journalist query. The Earth Island Journal writer contacted me July 17. Her name and email is Sam Schipani "
• Barlow to FOIA July 23 - "The journalist writing an article on our group, Torreya Guardians, cannot delay her interview with me any longer. On Wednesday morning this week she will interview me by phone. Please let your superiors know that at least some basic results will be appreciated so that I can speak while somewhat informed. Remember, the original deadline for this 'complex' FOIA passed two weeks ago. I imagine all of the staff are overburdened with too much work. But anything you can provide me with will at least be a start toward full compliance and thus evidence of collaborative good will, and I will be grateful." • FOIA to Barlow July 23 - "... "It was a pleasure speaking with you this morning regarding your request. As per our conversation, I am currently routing your final response through the Regional Office to be sent to the SOL's Office, however, I have three documents that have been deemed clearly releasable that I can send to you later today or tomorrow with a signed letter by the program. I’ve already spoken with the Deputy Assistant Regional Director about signing the letter to send you the fully releasable documents and he has agreed to sign it either today or tomorrow. There is still one document that I will continue to route through the RO and to the SOL's Office for review. Thanks and please look forward to receiving a partial response either today or tomorrow." • FOIA to Barlow July 24 (1) - "Attached is your signed 1st partial response letter and documents. As per our conversation, there is still one document that is currently being routed through the proper channels to be sent to the Solicitor’s Office for review. Thanks!" • Florida Statewide Plant Conservation Grant, Annual Report 2010-2011 FDACS Contract 016711; by Dr. Jennifer Cruse-Sanders, title: "Conservation of the critically endangered Florida Torreya." EXCERPT: Within the two year project time frame we expect to complete: 1) Documentation of the location, health condition, and size of naturally occurring T. taxifolia 2) Reports on the development of genetic markers and estimation of current levels of genetic diversity in existing populations of T. taxifolia, 3) Establishment of ecological experiments for testing optimal conditions for growth of T. taxifolia and adequate protection of extant populations from herbivory, drought, competition and edaphic influences within focal areas of Torreya State Park, 4) Documentation of techniques for long-term storage of T. taxifolia and tissue culture for safeguarding and maintaining germplasm ex situ. • untitled; 10 lines of table seeming to document specimens derived from wild branchlets as rooted by Arnold Arboretum in 1991. • Barlow to FOIA July 24 - None of the documents I was sent contain the answer to the simple set of requests I made: How many seeds were produced each year by the Torreya taxifolia trees outplanted for "safeguarding" the species at the Smithgall Woods and Blairsville sites, beginning in 2007 (and continuing through the last seed production, 2017). Also I requested a report of the ultimate destinations of those ex-situ-generated seeds year by year. Both parts of my request are very important not only for my information needs as founder of Torreya Guardians, but as crucial data for any scientist to assess the year-by-year progress in recovering this species. I do recognize that the ex-situ parent plants that have been producing seeds are crucial genetic safeguards against the species extinction. So too may be success in freezing embryos (since the intact seed will not survive drying or freezing). But the Endangered Species Act, which was enacted while I was still in college, was not limited to merely preventing extinction or "safeguarding" the genetics of the species. As a young adult, I was thrilled to witness the gains of how the act was implemented in its early years. The ESA not only prevented extinction of the Peregrine Falcon and the Bald Eagle but helped them to regain their prominence and geographic range in the wild. In the past I was willing to "live-and-let-live" with this aspect of the implementation of the ESA designation and not seek further information. Nor did I attempt to advocate that seeds of such an endangered tree should not be wasted on squirrels. But when it became clear that a person associated with Torreya Guardians was being accused of wrong-doing, and that he was also being blamed by Ms. Radcliffe for not notifying official staff until 2016 that seeds were being produced at the official ex-situ location, I realized that the hostility of officials toward our citizen group was no longer tolerable. Hence my FOIA request. "... Plant material was provided by Ron Determann, and a research contract was set up with the UGA Horticulture Department & GMREC to house and care for the trees. This was nearly 20 years ago, and it is unfortunate that we were not notified of the production of fruit before 2016. Luckily the new Superintendent immediately acknowledged that fruit had been illegally harvested without the knowledge of the project partners and put a stop to it. Only then did Jack inform us of the bounty that was available - because he was denied access. I was informed of his recent attempts to regain access to the plants, and that is not going to be allowed by GMREC or UGA." In summary, that a citizen is blamed for seemingly not reporting easily observable information about a grove of endangered trees growing along a marked pathway that citizens are encouaged to walk in a state park is not only unfair, but it suggests a grave failure of judgment by official implementers of the plan. I very much look forward to receiving the final set of documents still in process for fulfilling my FOIA request. • FOIA to Barlow July 24 (2) - "My apologies. This is the information I was provided. I'm currently following up with the Program Office. Thanks!" Part 2: FOIA Hiatus as Barlow Offers "Win-Win Solution"
• Barlow to FOIA August 3 - FULL TEXT: RE: Proposed win-win solution and the larger ESA imperative. 1. SEED DATA. On July 26, a new posting pertaining to ex-situ seed production appeared in the "Conservation Updates" section of the Torreya taxifolia page of The Center for Plant Conservation. Much of that I already knew; I simply wanted to seek that kind of report via the FOIA process. The data pertains only to ex situ plantings by the Atlanta Botanical Garden (ABG property plus Blairsville State Park). There is nothing yet published on the Smithgall Woods site, where Torreya Plantings are administered by the University of Georgia. Both sites demonstrate very problematic inattention to seed production (which is necessary for "recovery"), as the management concern apparently has been limited to genetic "safeguarding." Ergo, so long as the individual trees in the ex situ plantings remain alive, the Georgia institutions administering the Recovery Plan likely regard that there is no genetic gain or loss by doing anything in particular with the seeds. The seeds, thus, can be ignored, and possibly not even counted. In contrast, a citizen regard for ESA management, such as my own, would deem any management goal that simply seeks to "prevent extinction" and "safeguard plant materials" (rather than aim for "recovery") as far from adequate. 2. USF&WS CRITICIZED AT JULY 17 SENATE HEARING. The CNN video post of the 2-hour hearing on the "Recovering America's Wildlife Act" includes strong criticism of federal implementation of the ESA during the first three minutes. The committee chairman charges that endangered species are being "kept on life support." Torreya taxifolia (listed in 1984) could easily be demonstrated as a case example of such — but it doesn't need to be. 3. TOWARD A WIN-WIN SOLUTION. The USF&WS could encourage Atlanta Botanical Garden and University of Georgia to join hands with Torreya Guardians to present a stunningly successful example of what it could be like for other endangered plants to be managed into the uncertain future. This would especially apply to listed plants in which seed dispersal impediments likely account for their current small geographic ranges and thus put them in the greatest danger with ongoing "weather disruptions." Note that both the 1986 and the 2010 recovery plans for Torreya point to its "glacial relict" status as the likely cause of its exceedingly small and isolated range in n. Florida. Read the quotes at the top of this page. The seed-dispersal impediment for Torreya taxifolia is that, while the Chattahoochee River is an excellent delivery system for moving seeds southward from the southern Appalachians toward the Gulf Coast, vertebrate dispersers (squirrels) are the only modes of transporation for getting seeds back north. (See my "Paleoecology and Assisted Migration Debate" post.) Measurements taken by Torreya Guardians at a 90-year-old private grove of Torreya taxifolia near Highlands NC indicate that it took the trees nearly a century to establish offspring (with the help of squirrels) out to a distance of 40 yards. As well, such data indicate that there should be no fear of Torreya taxifolia becoming invasive if assisted to migrate back up into the Appalachian Mountains. 4. FOCUS ON THE LEARNINGS. Because no other glacial relict species is being managed with a deep-time understanding, it would be unfair to charge the creators and implementors of the 2010 recovery plan update for Florida Torreya as being negligent. There was no precedent for utilzing assisted migration for an endangered plant. And because no other citizen group had made use of the intentional loophole (just for plants) in the 1973 Act it would be wrong to focus on the conflicts that have arisen between the official plan implementers and the citizen volunteers (over whom the officials have no jurisdiction). Instead, we should focus on the learnings. I can easily report in hindsight the mistakes that I made in organizing and playing a leadership role in Torreya Guardians. While I do maintain a detailed account (private document) on all the seeds we distribute, year-by-year, numbers, where the seeds came from, and to whom we send them, and while many of the volunteers have eagerly reported results ongoingly, I have not been perfect in my record-keeping. As well, my encouragement to planters starting in 2013 to "freeplant" seeds into their regrowth forests experimentally to discern favored habitats and plant associations, largely resulted in significant seed predation by rodents — until volunteers began reporting successes by planting seeds 4+ inches deep (beyond the reach of rodents). Thus, the official implementers of the recovery plan are not alone in "wasting" seeds. The ABG recent effort to determine how to undertake long-term storage confirmed that drying or freezing are not options for intact Torreya seeds. Hence simple storage of seeds for use at a later time is not possible without high-tech "somatic embryogenesis," necessarily performed seed-by-seed  and thus very expensively. From the perspective of learnings, all pieces are in place for finally launching a combined institution-citizen effort to ensure that no seed goes to waste. We citizens are needed. The seeds surplus to ex-situ safeguarding or storage need not go to waste, and we Torreya Guardians do not need to be primary recipients. Crucially, very little, if any money needs to be allocated to USF&WS or the states in order to accomplish such partnerships. 5. ENLIST CONSERVATION ORGANIZATIONS AND GARDEN CLUBS to create plans and to recruit private landowners for receiving seeds produced in ex situ orchards that are deemed surplus to the official federal/state recovery projects. In effect, that is how ABG and Torreya Guardians inadvertently collaborated before 2016. PROPOSED AMENDMENT: For listed threatened or endangered plants that are encountering abnormal weather disruptions (notably, extreme droughts, intense and/or long-lasting heat stress, and/ or unusually mild winters conducive to population increases or range expansions of diseases and/or insect vectors of diseases), citizens may choose to volunteer their private lands for ex situ plantings in less stressful locations as specified by the USDA Plant Hardiness Zone Map. Citizens will engage via their regional land trusts, botanical garden clubs, conservation organizations, etc. 7. ... OR BY REGULATORY REVISION. This recruitment of citizens and supervising institutions could equally be accomplished within the regulatory revisions now under consideration. Note that this regulatory shift would encourage non-profit institutions to lead, thus replacing the conflictual binary of either the official recovery plan implementers or a lone or loose group of citizens paying their own way. 8. I WILL BE SUBMITTING COMMENTS BY SEPTEMBER 24 AS TO REGULATORY REVISIONS. I would dearly love to do so in a way that elevates the Florida Torreya case as demonstrating that such partnerships can be viable  and will surely work better when regional conservation groups and garden clubs step forward to play the intermediary role between citizen planters and those who implement the official recovery plan. The free labor of students and interns supervised by a regional university should be easy to engage. The opportunity for academics to create degreed projects (and publish papers) should be attractive to universities, not only in environmental studies programs but also in communications, horticulture, etc. I wonder if Atlanta Botanical Garden might be inclined to submit recommendations along these lines, too. I wonder if an informed, neutral party might play a role in our two groups being able to trade ideas, and hence converge somewhat on our recommendations. I wonder if we can be on the same team. • Vivian Negron-Ortiz in the USF&WS Panama FL office has deftly tried to manage the tensions. Notably, she reached out to invite Torreya Guardians to participate (phone conference call) in the final meeting of scientific and stakeholder advisors toward the 2010 recovery plan update). Two of us participated. She expessly asked the group to vote on whether to include an assisted migration pilot project. The two of us Torreya Guardians were the only participants to vote yes. Note: Although "critical habitat" has never been designated for Torreya, the nearby landowners who had Torreya on their properties not only were eager to cooperate; they seemed to feel such pride of ownership that they, quite naturally, were not willing to say "goodbye" to Torreya by voting to have northward locations tested as possibly more suitable. • Donald W. Imm, USF&WS State Supervisor (Georgia) was among the 6 signatories to a May 2016 memo of understanding titled "2016 Torreya Caution Statement to GPCA Botanical Guardians", which I received as an attachment from ABG Emily Coffey in her email to me February 2018. I was unaware of the accusations (and thus the hostility and unwillingness to communicate) prior to Coffey's email. I attach that pdf at bottom. 10. BE AWARE OF THE UNIVERSITY OF FLORIDA'S ENTRY INTO PROMOTING GENETIC MODIFICATION OF FLORIDA TORREYA. This past March, the university hosted an invitation-only meeting that resulted in a glowing press report of the Forest Pathology program moving ahead with using CRISPR technology to nudge a fusarium-resistant wheat gene into Torreya. The press highlighted the participation of E.O. Wilson at the gathering. At first I was livid; then I realized that enviro groups will swarm in at recovery plan update time, protesting that the most endangered conifer in the world is being handled this way. So I don't need to worry about it. But USF&WS does. Learn more about this turn of events by going to this page and scrolling down to my March 2018 entry. 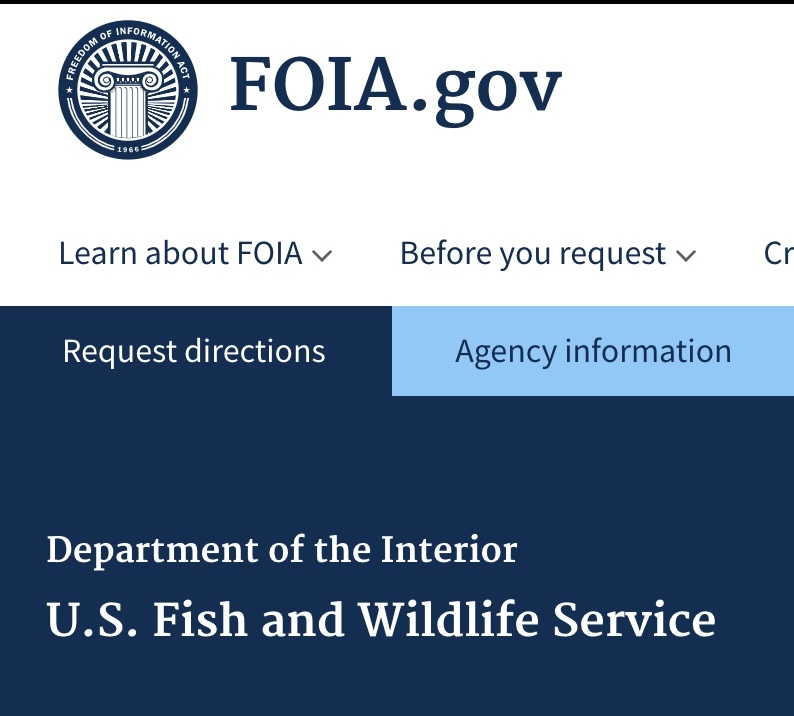 I look forward to working with your office to turn this FOIA problem into a win for the USF&WS in the ongoing "modernizing" of the Endangered Species Act and/or its regulations. • FOIA to Barlow August 3 - "I am in receipt of your email that you sent and I will send this to the responsible office for them to review your comments. I just want to be sure I'm understanding correctly--at this time are you withdrawing your FOIA request? Your help with this will be greatly appreciated. Thanks and I hope to hear from you soon." • Barlow to FOIA August 3 (3) - Tiffany - I request that my FOIA inquiry not be withdrawn, but temporarily be put on hold, pending your agency's consideration of my suggestion and my evaluation of the response. Thank you for your prompt and efficient communications with me on this matter. The final 10 minutes of an hour-long video I made are an overview of why the deep history of plant migrations is crucial for helping Torreya to not merely avoid extinction (lingering on "life support") but to actually recover and begin living once again with little or no human assistance. Thank you for your assistance in communicating the accomplishments of the volunteers in Torreya Guardians. • Barlow to Mary Pat Matheson August 7 (President of the Atlanta Botanical Garden). 1. Q: Did you receive my Aug 7 email titled, "Win-Win proposal to ABG for solving Torreya problem"? 2 .Q: If so, is it correct to interpret that neither you nor ABG is interested in communicating with me toward my presenting a story of learnings and future cooperation in the comments I will submit by Sept 24 re USF&WS proposed changes to endangered species implementation? 3. REINSTATEMENT OF FOIA ON SEED DATA. If the answer to Q2 is "no interest in communication," then I plan to reinstate my seed data request (currently held back by Solicitor's Office in DOI), which data I will post online and also use in my comments on the proposed ESA regulatory changes. 4. Q: Perhaps you and I could cooperate on just the core piece I will probably include in my comments to USF&WS. That is, please let me know if the idea below sounds reasonable, or how I might improve it. Do know that, if something like this can become the solution, then I can easily frame my comments overall in a cooperative way: that our combined learnings can help for moving not only our species of concern faster toward actual recovery and thus de-listing, but other relict plants that are likewise trapped in cool-climate refugia. PROPOSAL: Seeds produced in ex situ plantings that are deemed to be in excess of genetic safeguarding, extinction-prevention, or other recovery plan goals or projects shall be valued and managed as beneficial for "non-essential, experimental" plantings. Such non-essential seeds will be made available for experimental plantings by institutions that prepare and submit plans for engaging in their own experiments: (a) for discerning whether climatic or other conditions in their region might be more hospitable for species thrival than the current or recent historic geographic range(s) of wild populations and (b) for determining the specific local habitats (slope, aspects, plant associations, etc.) that yield the best results. Plans shall include institutional commitments toward monitoring for possible plant invasiveness, along with regular posting of reports online of experimental results, what has been learned, and recommendations for improving species recovery. 1. WASTING PUBLIC MONEY ON OUT-PLANTINGS THAT MAY FAIL. So long as the seeds are deemed "non-essential" under the established recovery plan, non-governmental institutions would be taking the risk of failure, not tax-payers. 2. INVASION RISK WITHIN RECIPIENT ECOSYSTEMS. In addition to institutional commitment to monitoring for invasiveness, for some plant species the risk can be demonstrated to be neglible from the outset. This would be accomplished by documenting non-invasiveness by seed-producing plantings that private landowners and landscapers undertook before or outside the species designation as threatened or endangered. Because Torreya taxifolia has been inadvertently served in this way for a century (beginning with the plantings at Harbison House, Highlands NC), Torreya Guardians have made a point of visiting and photo-documenting these key sites that prove non-invasiveness. Yesterday I finally completed a new webpage that makes it easy for officials and others to quickly review these examples of Torreya non-invasiveness. Please take a look at this new page and let me know if you think it is adequate: "Historic Groves of Torreya Trees." Dr. Catherine Phillips, USFWS Field Supervisor for the Panama City FL office returned my phone call this afternoon. She was the first person to be genuinely interested in my perspective and the history of the conflict. We talked for 2 hours. I sent her all the background and she seems to think that she can learn directly from DOI what exactly the hold-up on FOIA completion is. I told her that I was far more interested in an opportunity to come together as a team than in having that last part of my request fulfilled. On August 3, I emailed you my offer that your office could delay / put on hold further work on fulfilling my FOIA request (re numbers and ultimate destinations of Torreya ex situ seed production 2007 - 2017), while I explored possibilities for a win-win solution with USF&WS and the main institution (Atlanta Botanical Garden) that is implementing the management plan for Torreya taxifolia. None of the documents I was sent contain the answer to the simple set of requests I made: How many seeds were produced each year by the Torreya taxifolia trees outplanted for "safeguarding" the species at the Smithgall Woods and Blairsville sites, beginning in 2007 (and continuing through the last seed production, 2017). Also I requested a report of the ultimate destinations of those ex-situ-generated seeds year by year. Both parts of my request are very important not only for my information needs as founder of Torreya Guardians, but as crucial data for any scientist to assess the year-by-year progress in recovering this species. I would appreciate receiving the document(s) in two weeks, as I will want to ground my public comment (re the Sept 24 USF&WS deadline) in the data I obtain. Do know that while I was disappointed in not being able to establish communication (by email or phone) with most of the parties on my list, I do want to express my gratitude for the three USF&WS people who were willing to listen to me (by phone) and provide their understanding of agency limitations. 1. First, whoever the male phone receptionist was at headquarters of the Endangered Species program on the morning of August 16: Initially he transferred me to someone's answering machine. I immediately called him back and pleaded for a real human being, expressly asking for someone in the communications department. He arranged for Lisa Ellis to call me that afternoon. 3. Kelly Bibb, Southeast Region, Recovery. Ms. Bibb and I talked on the phone. She was familiar with the Torreya situation, and she was patient and courteous. She reiterated the point Ms. Ellis had made about the imperative for agency staff to maintain good relations with the implementing institutions. She spoke highly of the expertise and passion of Dr. Vivian Negron-Ortiz. And she allowed me to speak my piece as to why a focus on pathology and an aim to return Torreya to its peak glacial refuge in Florida was scientifically the wrong emphasis. Instead paleoecology expertise (coupled with the new imperative for even non-endangered plants of "climate adaptation") leads one to embrace the kind of action ("assisted migration") that Torreya Guardians have been donating their time for. As I recall, twice Ms. Bibb stated, "I remove myself from this species." Finally, Ms. McClurkin, please relay to DOI my appreciation for the three agency staff members above. I look forward to receiving the final document(s) re my FOIA request within two weeks. Do know that I will of course accept a signed document from DOI that the seed data simply hasn't been tracked by the implementing institutions. Thanks to Dr. Ellis, I now understand that USF&WS cannot compel documentation of anything that the implementing institutions do not value as worthy of their own attention and action. • FOIA to Barlow August 22 - "I am in receipt of your email of wanting to reinstate your FOIA request. The remaining document responsive to your request is currently being routed for final signature and I hope to have it to you soon. Thanks so much!" Don [Donald Imm, USF&WS Georgia] was terrific to talk with yesterday. Thank you for helping make that happen. I am reading some of his papers (via Researchgate) this morning, so I can follow up with giving him the best links for the paleo science aspects. I get the sense that Don not only will be getting in touch with AGB, but that he is probably the ideal person to do so. I did not speak to Don of how the Blairsville seeds have actually not been going to the rodents over the years, as that confidential information I want to entrust to you to figure out how to create a win-win story from it. Here, attached as a confidential pdf, is to give you the information that I have documented over the years of where we got our seeds from. You will see that the "success" in assisted migration that "we" are widely credited for would have been impossible without the massive seed donations we got from 2007 to 2015 via the superintendent at the Blairsville site. So it would be really easy to convert this history into a successful joint effort by all parties involved. I surmise that the seed-count documentation in this pdf is quite a bit more detailed than any of the official institutions could have provided to DOI to fulfill my FOIA request. So you can see that I launched that FOIA not as a means to discredit the official program, but as a bargaining chip. I feel that aim has been achieved, thanks to your willingness to think as a team player and now also my sense that Don will do that too. Know that the seed-documentation in the pdf is just the beginning section of what is now a 55+ page document, small type, where I also post, state-by-state, all the info (and refs of email dates, names, contact, addresses, phone, results) that I have received or generated over the years on the DISTRIBUTION side of the project. As some of the landowners are really private people, I keep the full document as confidential. Not until I received Emily Coffey's Feb 2018 email to me did I understand that the Blairsville donations (2007 - 2015) represent a very courageous action for the superintendent then in charge to have taken — and, apparently, ditto for our own Jack Johnston. Jack had a solid reputation as an extremely knowledgeable and pro-active (especially for Stewartia) native plant advocate in the southern Appalachians — until the May 2016 6-party memo. The 2010 Audubon Magazine article on our 2008 Waynesville plantings had Jack Johnston featured as the volunteer to profile. See here. Great talking with you. I found you on Researchgate so read your 2001 coauthored paper, will say more on my connections there later. Right now I want to give you some ideas for weekend reading (and Catherine, too, though I think the personal off-time she has coming up really ought to be non-work for overworked, understaffed researchers!). The recommendations here are to help you see the crew of top scientists (almost all forestry, not conservation biologists) already out there to tap into for free help. Know that I will generally be sending you to internal links on my own vast webpage "Assisted Migration Scholarly Links" on the Torreya Guardians website. 1. Click on "Ethics, Law, and History" and you'll see the top two papers by Patrick Shirey. Those clarify not only the plant loophole in ESA but why it was intentional. Shirey's work released me to be able to make videos of our plantings, because while I knew we were legal others didn't so finally I had a paper I could point to). I periodically talk with Shirey by phone  he now does fisheries research projects as an independent for USF&WS (despite a law degree and PhD fisheries ecology he couldn't land a university position, so desperate are these times of contraction). 2. Then look at the Forestry section and all its internal links. Notice that there I repost the Paleoecology papers that are specific to forestry. Grad students in particular who are getting into assisted migration (the youngers don't resist it the way the elders do) are very grateful for my listing an quick-read annotation work. By golly, I just eyeballed the whole paleoecology section and see that you could spend your entire weekend just on that, dipping in to read the full papers that interest you most. Notice the one titled, "Relict species restricted to disjunct and small ranges by Pleistocene Glacials." That is a must-read. It only deals with NA trees of the west but it is totally applicable to Torreya and Florida yew. Interestingly, Mark Schwartz (early Torreya researcher) and I sort of mended our conflict when we had an e-discussion about the huge necessity of helping out the dozen or so relict conifers along the foggy coasts. SE region is way easier than that for a variety of reasons. Oh, the "Relict species" paper is one of the last by the three truly elder forest researchers out west, Ledig, Rehfeldt, and Jaquish. Rehfeldt USFS long-retired has been mentoring me behind the scenes for a half-dozen years, though not at all on torreya, just on my citizen advocacy on the need for A.M. of even common western trees. 3. LOUIS IVERSON - Go back to the Forestry section table of contents and click on "Maps of USA Tree Species Future Ranges". There you will see the Western USA 76 tree species (Rehfeldt was the lead on that) and Iverson & Prasad 134 Eastern Tree Species. Absolutely also scroll a wee bit down to see the red-colored section "Understanding the Forestry-Climate Range Projection Maps" as the caveats and criticisms (including the the Elbert Little 1971 maps of then-current native ranges might already have been shown for slow-moving trees already lagging a lot behind then-existing warming  which is the obvious case for torreya, given the national champion T. tax is now in Ohio! I haven't communicated with Iverson for awhile, but know that when I visited their Ohio office in May 2015, I gave Louis 20 seeds from the fall 2014 harvest; he told me later he kept 3 for his own home planting and gave the rest to the USFS woman in charge of communicating with the public. So I bet they will be thrilled to help out with plunking T. tax into their computer model, using the IPCC scenarios, which I think the 5 year update volume 1 comes out in September. 4. Back up to the table of contents Forestry, click on "Superb Overviews ..." link and see the 3-map graphic. Notice that TORREYA TAXIFOLIA is the case study example foresters use for the most radical form of A.M. That's why they are grateful for Torreya Guardians: we make their own "Assisted Population Migration" and "Assisted Range Expansion" projects underway look tame in comparison. 5. Back up to table of contents, click on 2018. First paper there is Bonebrake et al. Review Paper. I annotate it a lot as it is behind a paywall. Know that HUGH POSSINGHAM IS ON IT. He is the distinguished Aussie who took over the job of lead scientist at The Nature Conservancy when the controversial guy moved on. Possingham is far more quantitative than I prefer, but he and I have communicated and overall, because Australia is so maxed out on climate problems that A.M. is no controversy there, he would be a KEY SCIENTIST to team up with  given how many endangered plants are protected on Nature Conservancy easements. 6. Make sure you read the original pair of Barlow & Martin v. Schwartz forum papers in Winter 2004-05 Wild Earth. Just google "Bring Torreya taxifolia North" and Schwartz "Conservationists Should Not Move Torreya taxifolia". 7. See that I can talk technical at a VIDEO of a college-wide lecture I gave 2015 at the Forestry & Environmental Sciences School at Michigan Tech U. It is on the overall assisted migration controversy, with Torreya just used as an example. There I really go into the 1491 paradigm generated fears and why forestry folk are so far ahead of conservation biologists: "CTL 08: Foresters Outpace Conservation Biologists in Climate Adaptation". Attached is your Final Response and responsive document. Please consider this matter closed. Thanks! • 3-page redacted email dated 5 March 2008, from Stan Simpkins to Vivian Negron-Ortiz (both USF&WS). That document is a forward of an email from Connie Barlow, also dated 5 March 2008. Absent the names, that same email content was posted as the 03/05/08 entry, by Lee Barnes and Connie Barlow, "Distribution of Fall 2007 seeds donated by Biltmore Gardens" on the Reports / Comments chronological list on the Torreya Guardians website. Barlow wrote 07/20/2004: "One quick QUESTION FOR YOU: If someone were to chooose to collect T. tax seeds this fall from the grove of thriving trees at the Biltmore Gardens in Asheville (Bill Alexander there will surely say yes, as he has been despairing having to mow the seedlings planted by squirrels in the lawn! ), and if these were then planted solely on privately owned land up in the Appalachians or Cumberland Plateau, would there be no need for permits or other communication with your office or any other federal agency? Thank you for sending me the final documents (below) re my FOIA request. I am satifsfied with what I have received. I am cc-ing two staff members of USF&WS because these are the two people with whom I have recently had long phone conversations, and who have helped tremendously in this matter. I thank Lisa Ellis (headquarters communication) for urging me to contact Catherine Phillips. From Dr. Phillips I then realized I could also reach out to Dr. Imm. Both were excellent listeners re my concerns, and both were very receptive to discussing the science (notably, paleoecology) that prompted me beginning in 2004 to dedicate time and action in behalf of Torreya taxifolia. You have been an excellent communicator in this FOIA matter since the beginning. My one suggestion for the future is that, with respect to USF&WS, so long as it is not a lawyer or a journalist who launched the inquiry (and is merely a citzen, like myself), and so long as the matter seems to pertain to policy or management, do try to recruit a senior staff person at the outset to make a phone call to see if the issue can be resolved in a friendly manner, outside of the FOIA. I now sense that the USF&WS and I are on the same team. We all want to see the endangered Torreya taxifolia well served under the guidance of the ESA and possibly with the free help of volunteer citizens like myself who are eager to host "nonessential, experimental" seeds on our own forested properties within states northward of the tree's historic range in Florida. I personally will continue to document (and report on our TorreyaGuardians.org website) what we learn about the exact micro-habitats where the species seems to do best "in the wild" at this stage of ongoing climate change. What I personally have learned thus far leads me to conclude that Torreya taxifolia can be de-listed soon. This stage would entail botanical gardens continuing their excellent work and we citizens continuing ours. Notably, the ex situ "orchard" plantings by Atlanta Botanical Garden and University of Georgia that have been producing seeds prolifically at the Blairsville and Smithgall Woods sites demonstrate that such plantings in or near the southern Appalachian Mountains easily "prevent extinction". As well, horticultural plantings from long ago that established specimens at a cemetery in Ohio (now the "national champion" Torreya taxifolia) and in Pennsylvania attest to the species' ability to thrive in latitudes well north of the historic range in Florida. Crucial too are the near-century old groves planted in North Carolina: at Biltmore Gardens near Asheville and Harbison House near Highlands. Both have been producing seeds for quite awhile. Moreover, the multi-age seedlings and saplings naturally established nearby attest to the species' ability to thrive and expand its population without becoming invasive in the recipient ecosystems. Thanks to these two historic groves, "recovery" clearly is possible for this species (and with no need for genetic engineering toward disease resistance), so long as the locales chosen for seed distribution reflect the scientific understanding that Torreya taxifolia is a "glacial relict"  unable to move north from its peak-glacial refuge in Florida at the end of the Ice Age. Documentation of Torreya's ability to thrive in northern states and the "naturalization" of century-old groves in North Carolina can be found at this webpage on the Torreya Guardians website: http://www.torreyaguardians.org/historic-groves.html. The long-understood recognition of Torreya taxifolia as a glacial relict can be accessed here: http://www.torreyaguardians.org/extinction.html. The scholarship and news reports on the climate-change adaptation strategy known as "assisted migration" is here: http://www.torreyaguardians.org/assisted-migration.html. The history of Torreya Guardians actions and what others have written about us is here: http://www.torreyaguardians.org/guardians.html. Our ongoing learnings about how to plant and nurture Torreya is here: http://www.torreyaguardians.org/propagate.html. VIDEO: Grief and Gratitude in a Time of Climate Change (Barlow). 1. I need to meet the SEPT 24 DEADLINE FOR ESA REG COMMENTS. I definitely want to offer comments on the proposed regs. My sense is that the most helpful thing I could do, both for the agency and for Torreya, is to simply gather personal statements from a good number of our many volunteer planters on why they are thrilled to use their property and their time to freely help this glacial relict species (a) have a better chance of preventing extinction, and (b) benefit from northward locations in a variety of habitats and plant assemblages such that insights into best habitats for thriving (and fending off diseases) at this stage and future stages of climate change will be ongoing. 2. I need to COMMUNICATE TO THE TORREYA VOLUNTEER PLANTERS THAT WE HAVE NO SEED SOURCE THIS YEAR. Our lead volunteers do know of the horrific results of the "Torreya Symposium" in March, and I have already let those leaders know of the break-through in possibilities that I sense from having talked with the two of you. But I also need to do an annual communication with all our planters to learn (a) of any new growth or losses this past year, and (b) to let them know that there will be no seeds available this year to supplement their plantings / genetics. I am confused about what kind of "spin" I should put on that overall communication. • Barlow to to Leah Gerber September 7,: "Torreya taxifolia case study shows cheap way to de-list plants"
I am founder of Torreya Guardians and coauthor with U AZ Pleistocene ecologist Paul S Martin of 2004 advocacy paper, "Bring Torreya taxifolia North Now!" I see in your 2016 paper that T. taxifolia is "underfunded." Necessarily, in a broad data-base analysis, that would seem the conclusion. However, knowing how this endangered subcanopy tree has actually been managed through the years, leads me to disagree. SCIENCE FOUNDATION: The above recommendation stems from the likelihood that other endangered plants south of peak-glacial ice advance in the eastern states may, as with Florida Torreya, signal relict populations that (for a variety of reasons) were unable to track Holocene warming poleward. This is indisputably the case for Torreya taxifolia, and has been since science publications described it as such beginning in 1905 (also the 1984 Federal Register listing as endangered, the 1986 recovery plan, and the 2010 plan update). POOR MANAGEMENT CHOICES, NOT INADEQUATE FUNDING: We Torreya Guardians used a loophole in the ESA (just for plants) to acquire seeds from horticultural specimens in North Carolina and begin assisted migration on our own in 2005, but with minimal seed numbers. The problem is that not until the 2010 recovery plan update was "assisted migration" northward even considered as a possible management strategy within the drafting of the official plan; however the "pilot project" offered by USF&WS staff was voted down by the science advisors + stakeholders, with only two of us Torreya Guardians in the mix voting yes. POLICY RECOMMENDATION: Farm out all "glacial relict" plants to The Nature Conservancy and other land trusts expressly for citizen/landowner-led plantings in states northward of the historically known native range. Cease all USF&WS internal or external funding of "research science" for these plants. Instead, designate an appropriate amount of funds for nothing more than within-agency "management," with an emphasis on USF&WS communicating with citizen planters (via their land trusts) and encouraging documentation, evaluation, and sharing of results by the land trusts or other NGOs toward the goal of identifying ideal latitudes and habitats for species health and reproduction  while aiming to minimize the need for continued human interventions (hence, culminate in de-listing). 1. NATIVE RANGE IS A KNOWN PEAK GLACIAL REFUGE: Any southeastern USA species or subspecies residing only within or near one of the premier "glacial refuges" at the downstream ends of the major rivers draining to the Gulf or Atlantic should automatically be deemed a glacial relict. The three major refuges are (Tunica Hills for Miss. River), Apalachicola (end-point of Chattahoochee River), and Altamaha River. 2. SOLUTION TO THE PALEOECOLOGICAL "REID'S PARADOX" suggests there may be many more small glacial refuges for eastern temperate plants, distant from the coasts of the Big Three. If a plant seems limited to a particular habitat type disjunct in geographically isolated locations, and if its seed is not wind-dispersed, then it may be a "left-behind" glacial relict. 3. DOCUMENT HORTICULTURAL SPECIMENS IN NORTHWARD HABITATS. Torreya Guardians is unique not only in engaging in the numerous "assisted migration" experimental plantings in 10 northward states (as we are trying to discern, too, the northward limits of species' thrival, anticipating ongoing climate change). We also prioritize finding and image-documenting long-ago horticultural plantings  especially those that produce seeds and where such seeds have produced seedlings and saplings with no human interventions. Such documentation offers a way to ensure (a) species thrival at that location and (b) species non-invasiveness. Conservation biologists who have published papers critical of "assisted migration" in the aggregate have pointed to (a) possible waste of money re failed outcomes and (b) possible invasiveness as the two main bases for their opposition. This point is so important that I recently posted a new page on the Torreya Guardians website to aggregate the "historic grove" documentation of our species (as far north as Pennysylvania for this "Florida" native!). Please take a quick look at it: http://www.torreyaguardians.org/historic-groves.html. HOW RESEARCH FUNDING CAN BECOME ANTI-CONSERVATION. In recent years, several initiatives by the implementing institutions have held back recovery of Torreya taxifolia: Research was conducted by Atlanta Botanical Garden to try to dry or cryopreserve T. taxifolia seeds for "preservation of genetic material" as a means to "prevent extinction." Torreya seeds are big and recalcitrant, however, leading to the discovery that "somatic embryogenesis" is the only way to "cryopreserve" genetics (just the embryos). Meanwhile, prolific seed production at one of the two ex-situ plantings in northernmost Georgia (s. Appalachians) were left uncounted and allowed to "go to the squirrels" (while we were denied access to the seeds). I filed a Freedom of Information Act request this year, which formally confirmed that ex situ seed production was uncounted and therefore presumably unvalued. Communications I have had with officials confirm that species "recovery" is viewed as not possible at this time because (a) money is insufficient and (b) (by implication) it is pointless to continue trying to return seeds or seedlings to their native Florida range until a University of Florida forest pathology lab genetically engineers (using CRISPR) fusarium-disease resistance into the Torreya genome. And there is no other range designated as the locale for recovery. REQUEST: When you have a chance, please call me for a short phone call on this matter. Three upper-level people in USF&WS are aware of my criticism of the official management of Torreya taxifolia. Two have been very open to hearing my perspective. Do consider that our group's record of tremendous citizen enthusiasm for welcoming an endangered plant onto private lands could be a helpful antidote to the negative publicity that will surely arise re the Oct 1 U.S. Supreme Court proceeding on the Dusky Frog critical habitat case. In case you prefer to contact those two staff people first, I list them in the cc line above. I would like to file win-win suggestions by the Sept 24 deadline for ESA comments, and I would like to forge a degree of citizen-agency teamwork into the future, if possible. Hence, this email to you. Do know that I fully support the importance of your work in advising pragmatic and effective management of endangered species in the USA. Please consider the successes and failures of 14 years of Torreya Guardians efforts as a crucial case to study within the parameters of your consultation for the U.S. Fish and Wildlife Service. I just left you a long phone message re the crucial role TNC can play in formally recommending to USF&WS a way to "modernize" how the Endangered Species Act is implemented. Comment deadline Sept 24. As founder of Torreya Guardians (first group to use loophole in ESA to move a climate-endangered plant poleward), I get lots of media attention on this (e.g. hour-long phone call with NYT journalist last Friday). • TNC role: Recommend that plants currently on "life support" (words of Senate Chair in July ESA hearing) be screened (by TNC, using its own funds) as to whether they are "glacial relicts". For each species so judged, suggest that USF&WS offer to TNC and other land trusts opportunities to forge their own recovery plans for poleward experimentation toward recovery — using existing private conservation easements for experimental plantings). USF&WS would contribute seeds and seedlings deemed "non-essential and experimental." • Torreya taxifolia as case study: Torreya taxifolia was declared a glacial relict in 1905 botany journal, F.R. ESA listing in 1984, in 1986 recovery plan, and 2010 plan update. (See below for more detail.) But recent implementation will not admit that past inability to track climate change northward from well-known "peak glacial refuges" is a reason to try "assisted migration" to cooler realms, much less that future climate change is an additional reason to do so. Note: March 2018 Univ. FL "Torreya Symposium" concluded the next step should be genetically engineering disease resistance into Torreya taxifolia in order to finally be able to help it survive in Florida. No mention was made of experimenting with "assisted migration," nor of our successes. Prior to that outcome, our group had a "live and let live" attitude toward USF&WS and its prime implementer (Atlanta Botanical Garden). After that GMO declaration, I decided to use FOIA to extract data that I already knew would be immensely damaging to how the official management would be viewed by mainstream conservationists: I asked for data of numbers of seeds produced each year, 2007 - 2017 in the 2 official ex situ plantings and their "ultimate destination". FOIA complied well, but the results were so embarassing that it was held up in DOI solicitor's office for several months beyond the original "complex" 6-week deadline. I launched that FOIA in order to leverage teamwork. I tried to use the FOIA results to leverage teamwork with ABG: nothing. Then, when I finally got high enough up in USF&WS for long phone calls (beginning with Chief of Communications, headquarters) I started making progress. But ultimately, not until I figured how TNC could play the lead role in somewhat "privatizing" Torreya's recovery (and other glacial relicts) did I see a way to have the conflictual days of citizens v. govt fade away: Torreya Guardians will no longer be necessary. Citizens will gain the thrill of helping an endangered tree in their own forested lands by having TNC play the reputable intermediate role. This shift in implementation under the existing ESA should really appeal to libertarian members of Congress. Thus, western governors might achieve some down-shifting of management to their state DNRs, but eastern congresspeople could thrill to showing a similar track appropriate for the pro-conservation flair in the east: and banking on TNC's reputation and corporate respectability. Note: I suggested to NYT journalist last week that Torreya taxifolia is the "mirror image of Dusky Frog": Officials unwilling to donate excess seeds to us (FOIA result confirms thousands of seeds went to the local squirrels instead), thus "under-reach", whilst the Dusky Frog case is the outlier of agency "over-reach"  single-case failures at both ends of the spectrum in which some 1,500 other recovery plans are appropriate and wise. Not a bad track record for DOI. But somebody has to spin it that way; F&WS will not step out that way. Forwarded email below will give you the science back-up and cites. Possingham knows me. I just noticed on the species profile page of USF&WS for Torreya taxifolia that on 6 August 2018 the Federal Register published a notice of a 5-year review. The publication said that the deadline for submission of information was October 5. I apologize that I missed the deadline. Please accept the following webpages from our Torreya Guardians website as vital scientific / natural-history / recovery success information for your review. 1. "Historic Groves of Torreya Trees"
There you will find our best work in explaining (and linking) to data collected by Torreya Guardians that documents (1) Torreya's ability to thrive, be disease-free, and even reproduce in locales north of Georgia; and (2) strong evidence that, while Torreya is able to "naturalize" (produce viable seed and establish seedlings from that seed, with no human assistance) it is decidedly not invasive. Thus, the two thresholds (unmet at the time of the 2010 plan update) for official adoption of "assisted migration" have been met. 2. "What We Are Learning"
Make sure you see the image-rich entries for 2018, which include documentation of 22 seeds being produced in Cleveland Ohio. Watch the linked Cleveland video (14 minutes) to see how extraordinarily well this tree adapts on its windward side. The only assistance this group of 3 seed-grown trees receives is (a) mowing to ensure no shade will overtop the torreyas, (b) deer repellent sacks, (c) fencing during buck season to prevent antler rubbing. Also, see the November 2017 entry and watch the "free-planting" success of our new Cumberland Plateau volunteer (400 seeds put directly into his forest). 3. "Recent Papers on Stem Canker"
1. ADVISORY COMMITTEE FOR TORREYA TAXIFOLIA. Please add me to your e-list for receiving whatever communications you routinely send to your science advisors and area "stakeholders." All citizens in the USA are stakeholders for endangered species. We Torreya Guardians have demonstrated our concern and care for this tree. 2. INFORM ADVISORS OF GLACIAL RELICT HISTORY. If there is any science advisor or stakeholder who is still unaware that Torreya taxifolia is a glacial relict, please refer them to the "Natural History" page of our website: http://www.torreyaguardians.org/torreya.html There you will see that we recently added images and excerpts from a pair of 1905 papers written by two famous botanists (Cowles and Coulter) that demonstrate that Torreya taxifolia has been regarded as a glacial relict since 1905. 3. DOCUMENT AND POST 2018 SEED PRODUCTION AT EX SITU LOCATIONS (and eventually their ultimate distributions too). As you know, I launched a Freedom of Information Data Request this year, whose results documented that the two institutional caretakers of the ex situ T. taxifolia plantings in north Georgia have not documented annual seed production at those sites and the fate of those seeds. In my view this is a grave loss of what should have been easily collectible data for assessing the thrival and reproductive potential of this species when translocated from Florida to the southern Appalachians of north Georgia. Please urge those institutional implementers (Atlanta Botanical Garden and University of Georgia State Botanical Garden) to provide USF&WS with documentation of this year's seed production so that you can post it on your records page and for them to also post it on the Center for Plant Conservation site. Note: I have posted all correspondence re my FOIA data request: http://www.torreyaguardians.org/foia.html Please make sure you read the August 29 entry: "Barlow's Closing Statement".